The Fenix HL12R rechargeable headlamp is the perfect headlamp for hiking and camping with a maximum 400 lumen burst for quick blasts of light and up to 110 hours of runtime for extended stays. Containing a built-in battery, this headlamp is USB rechargeable with a battery indicator so you’ll always know when charging is needed. Dual switches quickly control the six general lighting levels plus the red light/flashing and SOS functional modes. IP66 rating for rain proof/dust proof, plus the sweat-channeling headband, makes the Fenix HL12R headlamp a great option for bad weather outings. *The runtime of Burst mode is the accumulated time without time-limited downshifting and overheat protection. Press and hold the General switch for 0.5 seconds, the lamp will be activated at Eco (no memory circuit), press and hold any switch for 0.5 seconds to turn off the lamp. Press and hold the Functional switch for 0.5 seconds, the lamp will be activated at Red (no memory circuit), press and hold any switch for 0.5 seconds to turn off the lamp. With the lamp switched on, single click the Functional switch to cycle through Red→SOS→Red flash. In any status, press and hold the any switch for 1.2 seconds to enter Burst mode. The lamp will exit Burst mode after 1 minute or by any other operation. Lock: with the lamp switched off, press any switch or simultaneously press the two switches for 3 seconds. Lamp will switch off and 4 2Hz blinks will indicate locked status. Unlock: with the lamp switched off, simultaneously press the two switches for 3 seconds. The lamp will be unlocked and activated on Red after 4 2Hz blinks. In locked status, clicking or pressing the headlamp will activate 42Hz blinks on Red to indicate locked status. The built-in 1000mAh Li-polymer battery is irreplaceable, and Micro USB rechargeable. Uncover the anti-dust cap and plug the Micro USB side of the charging cable into the charging port of the lamp. The normal charging time is about 2.5 hours. Note: The headlamp can only be used on Low output when charging. Note: The battery level indicators displays the battery status each time when the lamp is turned on on General mode. The lamp will accumulate a lot of heat when used on Burst mode for extended periods. To avoid high surface temperature, it will automatically downshift to High output level to reduce temperature. Step 1: Attach the headband to the headlamp. I use it for running early and late in the day, works perfect. Great little headlamp for the money. Very light on the head and the beam is very usable, no weird artifacts and nice compromise between spot and flood. Brightness is just about perfect. I’m using it every single day morning and night feeding animals and dealing with firewood, and the battery lasts me a few days before a recharge. Lithium battery so far works great in the cold, which is not the case for alkaline or nimh. I wish you could swap in different batteries on the fly, but thats not really what this headlamp is for. The micro-usb charging is very convenient, seems like I always have at least one other device that also runs on this cable, so its easy to find. Nice light, my wife uses it for night time dog walking, I love the easy to see battery level indicator ! A great rechargeable headlamp. The red lamp and the brightness controls make it work well. I would recommend this headlamp. Don’t love the built-in battery or more precisely the fact I can’t carry a backup with me. What I did was bought a small portable battery charger to throw in my back on camping trips because I prefer this light over others for most activities. So my opinion is that this headlamp is great for general purpose (around camp, work around the house, walk the dog, short runs). Do not buy this if you are running for longer distances (longer than an hour) or if you are using for trail running (no throw down the trail). Good hiking light because of battery indicator, good runtimes, and comfortable. I didn’t think I would use the 400 lumen boost, but it really is a nice option to have and I have used it to extend that reach of light to see the things making noise beyond 25 yard mark. This would be a 5 star for general activities, but I gave it 4 stars because I would prefer that it have the ability to carry a backup. 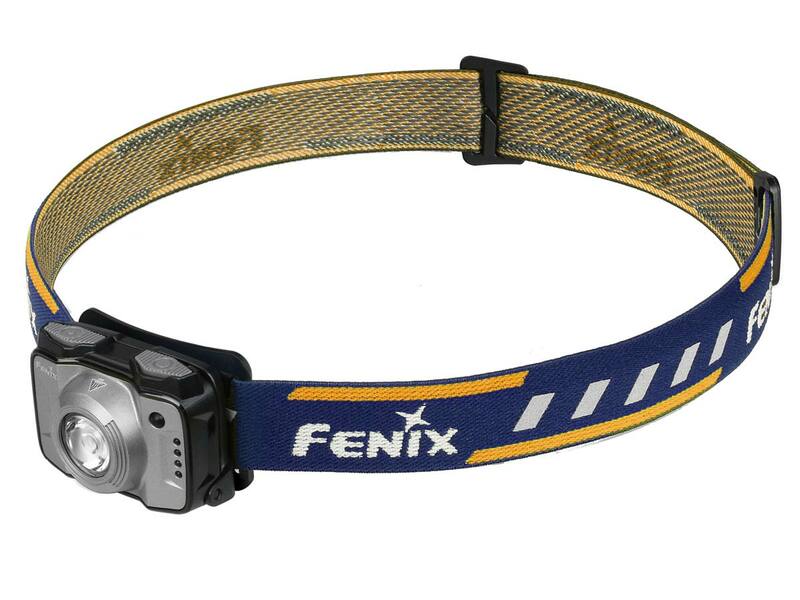 On a side note, I highly recommend another headlamp from Fenix for runners, HM50R. The HM50R is also is a great hiking headlamp. Buy a backup rechargeable battery for the HM50R (ARB-L16-700) and easy to carry with you to always have a backup in a light that has great throw and spill beam with power. Perfect headlamp for my home inspection business. Wasn’t sure what would happen if a built in battery had an issue so called Fenixlighting to discuss. Blake informed me that it will be 500 cycles before showing a decline below 75%. The factory can replace the battery if requested after this. Just some simple math. I use my headlamp every day for about 20 to 30 minutes on a mix of different levels and have not had to charge it any sooner than 14 days in my first 60 days of use. So I avg 2 charges a month at 12 months is 24 charges. Heck, let’s round it off to 30 cycles a year. That is is a long time folks. And I use my light everyday. Avg person probably uses their headlamp 4 to 5 times a month. Don’t make the built-in battery keep you from buying one of the best headlamps ever created. Awesome! Way smaller than I thought it was. Light weight and plenty of brightness. Simple operation and is easy to use with gloves. This is a major winner!